My fingers are still aching from setting all the teeny tiny bezels, but it is work that I welcome. I am so grateful today that I can work, that I have many ideas that i want to explore, that I have ambition to move forward with excitement in the future. I am currently exploring a more "fine" jewelry style that I find intensely rewarding. Yesterday I did something that I rarely do--I took a long nap. I let my mind wander around and draw and plan in peace and leisure. I felt in touch with my higher power and was serene. These earrings are part of a new line which I call Byzantium. It combines influences from the ancient Roman and Byzantium styles with modern lines. Yes, the labradorite are really that lovely too! 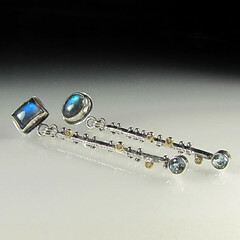 hand fabricated out of sterling silver, 18k gold, champagne diamonds, labradorite, and blue topaz. Now I'm off to my bench to go and create some more! Awesome! These look great, and I can really see the ancient influence in the design.